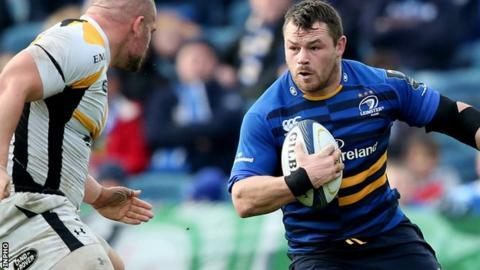 Ireland prop Cian Healy has signed a new three-year IRFU contract which will keep him at Leinster until the end of the World Cup in 2019. The 28-year-old has won three European Cups, a Challenge Cup and two Pro12 league titles since making his Leinster debut in 2007. The first of his 58 Ireland caps came against Australia in 2009. "I am looking forward to competing for silverware over the next few seasons," said Healy on Wednesday. Healy is set to return for Ireland in the Six Nations after recovering from a knee operation. He added: "There are a lot of exciting young talented players coming through at Leinster and Ireland while I feel that I am coming back to full fitness now. IRFU Performance Director David Nucifora said Healy is "one of the most explosive athletes in world rugby". "He has proven for both Ireland and Leinster his ability to compete at the highest levels of the game," he added. "We are delighted that Cian has committed to playing in Ireland up until after the 2019 Rugby World Cup in Japan."